Over the course of this last year however, I have learned quite a bit about eating more healthy and what we should be feeding our bodies to function properly. One help that has changed my view completely is a seminar I took from the Green Smoothie Girl. Very awesome AND informative. I've also done more research on juice fasts and why they are good for the body, learning quite a bit along the way. I recently watched this documentary and was reminded of the positive effects that juicing can have. So with that said, this last week I decided to go for the goal again. Let me tell you the juice fast was not easy, but it ended up being really beneficial. I really have loved learning more about the impact that foods can have on our bodies and have made huge steps to getting our family more healthy. We are definitely not perfect but we are trying. Now you may be wondering.. what does this have to do with being crafty? Well my project this week is a healthy recipe that I stumbled upon . It's one that our family has absolutely LOVED. And again, lets see some of your project, your crafts, and lets party! Preheat oven to 400F degrees, with a rack in the middle. Butter or oil an 8x12-inch baking dish, or two smaller gratin dishes. Sprinkle with lemon zest and set aside. Bring a large pot of water to a boil, salt it generously, and cook the pasta until al dente. Just 10 seconds before you are done cooking the pasta, stir in the butternut squash and kale - for the quickest possible swim. Quickly (but carefully) drain. Now run cold water over the pasta, squash, and kale (just enough to stop it from cooking). Shake off any extra water and set aside.While you are waiting for the pasta water to boil, whisk together the yogurt, eggs, garlic, and salt in a large mixing bowl - set aside until the pasta is boiled. Then. 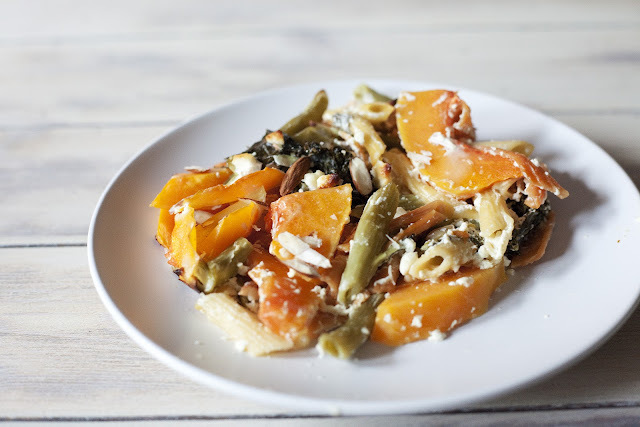 when ready, add the pasta-squash-kale mixture to the yogurt mixture and stir in half of the almonds. Scoop everything into the prepared baking dish(es), sprinkle with olives and feta, and bake for 25-30 minutes. Remove from oven and serve sprinkled with a bit of the chopped fresh mint and remaining almonds.